How to compute Pr(S>100) when S follows Geometric Brownian Motion? I have been trying to resolve this problem, under (b), but I cannot find the correct answer. For i=1, my ultimate answer (P=1) deviates from the correct answer (P=0.7580). Please let me know whether my computations are wrong or not. In blue is the solution according to the solution manual; my computations start at For i=1. I wrongly assumed that that a random normal variable's distribution was described by its mean and volatility. It is, however, described by its mean and variance. So for the denominator in the Z computation I now use 0.1 (volatility) instead of 0.01 (the variance, which I had mistaken to be volatility), which results in the right answer. Not the answer you're looking for? Browse other questions tagged black-scholes distribution or ask your own question. 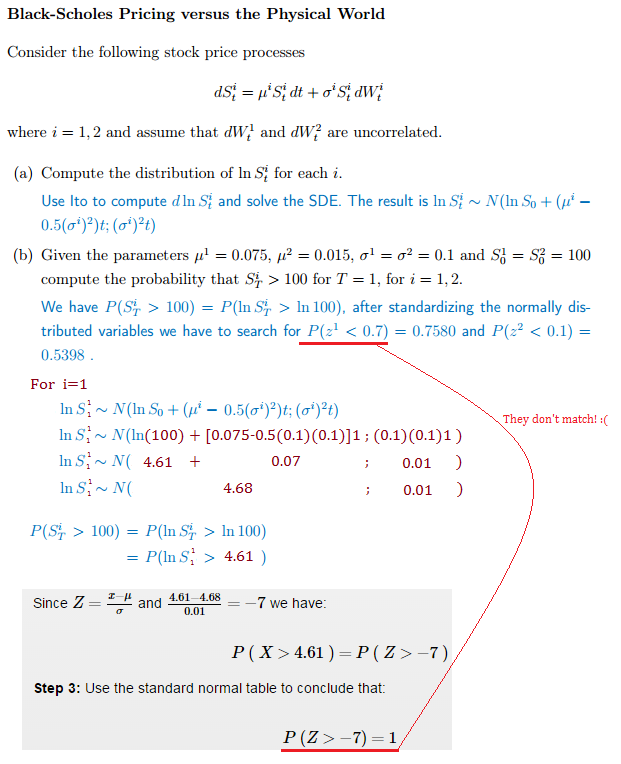 Can we explain physical similarities between Black Scholes PDE and the Mass Balance PDE (e.g. Advection-Diffusion equation)?